Anyone who knows Fredericton, New Brunswick writer, editor, visual poet, artist, radio host and publisher Joe Blades knows he’s been filling notebooks up for nearly three decades, traveling across country with notebooks, pens and gluesticks, to include whatever he happens to find around him that day, including text fragments, posters, stickers, and all sorts of other detritus. After years of collecting, he’s worked some of the text into a small trade book, from the book that doesn’t close (Fredericton NB: Broken Jaw Press, 2008). This is Joe Blades working through his daily routine. Created directly from journal entries, these poems seem to be structured between a mix of Leonard Cohen’s Book of Longing (Toronto ON: McClelland & Stewart, 2006) and George Bowering’s own His Life: A Poem (Toronto ON: ECW Press, 2000), working its way between the accident of first thought and the deliberate reworking of a poem made from randomly-found material. Some of the material works, and some of it doesn’t, making it a strange mix of journal/diary entries, notes made to self, and thoughts while going through the work of his every day. 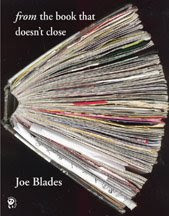 Blades has done some interesting work over the years that, for some reason, he hasn’t received much credit for (his absence, for example, from an anthology of Atlantic poets a few years ago was quite baffling, and even offensive), and usually his conceptual writing, as well as his visual works, has far more going for it than his straight literary writing. Still, this is an interesting work, however uneven, and only goes to show how much is going on in these notebooks; haven’t there been those over the years that have suggested that the notebooks alone are worth putting on display somewhere?